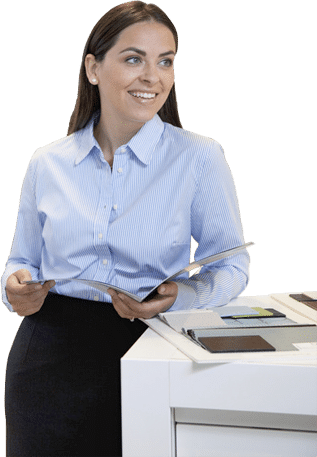 Considering that enterprise-class copiers can cost as much as a used car, finding the right copier for your small business can become an intimidating task. Leasing helps small business owners to find the right device while having a support system for troubleshooting and breakdowns. However, because a copier lease exists as a contract, you have to read the terms carefully. When looking at a vendor, look at the availability of certified maintenance technicians in your lease plan. Brands such as Xerox offer rentals directly to businesses, and they use contractors for maintenance and repair. However, check with your vendor to see if they provide support in your area. Leases typically include support costs, so vendors can usually provide you with numerous options for support. Before signing that dotted line, examine the price carefully. Compare the lease price versus the retail value to determine how much it truly costs. How do you judge between the two? Multiply your monthly lease price by the amount of time you plan to use the copier. If you find the total is far greater than the price paid at a retail outlet, you are not receiving a good value. In addition, look at maintenance in your agreement. Do you pay for support or does the leasing company? You should also check the physical location requirements to see if you are required to run a diagnostic test. Check to see if there are procedures you cannot do unless at the request of a technician. A maintenance clause exists to limit the damage to the copier, but you should check if it exists in your lease because you can be charged a big fee if you break the clause.